NLD supporters celebrate their landslide over the military dominated government. 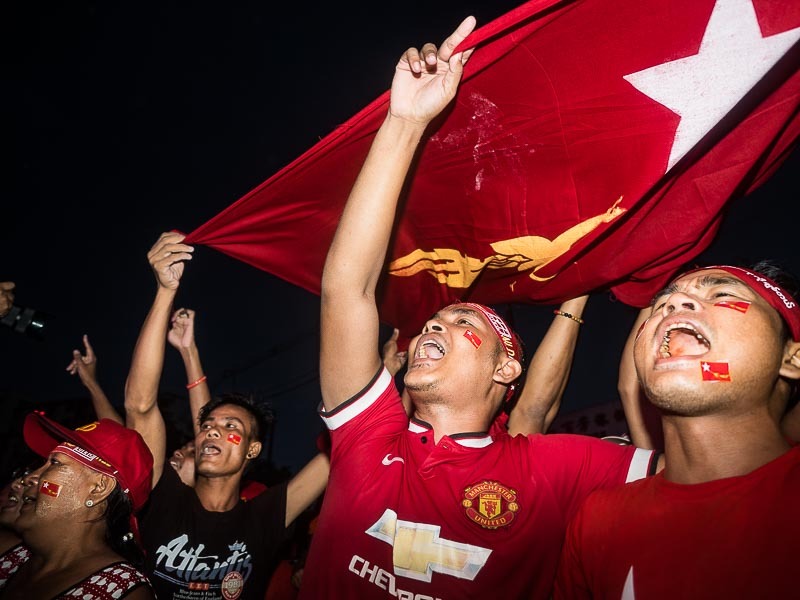 As election results continue to trickle in Myanmar, one thing has become clear. 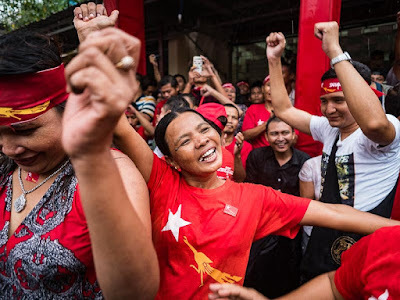 The National League for Democracy (the NLD), the party of Aung San Suu Kyi, has scored a landslide victory. Not all of the results are in yet, but at this point they seem destined to control both houses of the national parliament. There are 323 seats in the lower house, and the NLD controls at least 196 of them. The USDP, the incumbent government party supported by the military, is the second highest vote getter. The USDP won 23 seats. That's not a typo. It's not 123 seats. It's 23, one less than two dozen. Results are still trickling in, primarily from rural areas on the edges of Myanmar. These are not considered NLD strongholds, so it's possible the final numbers will not be as overwhelming as they now seem. But the NLD lead at this point is essentially insurmountable. People dance in the rain during the victory party. People gathered in front of the NLD offices to cheer, sing, dance and celebrate their victory. It was a raucous, joyous crowd. It was an amazing thing to experience. 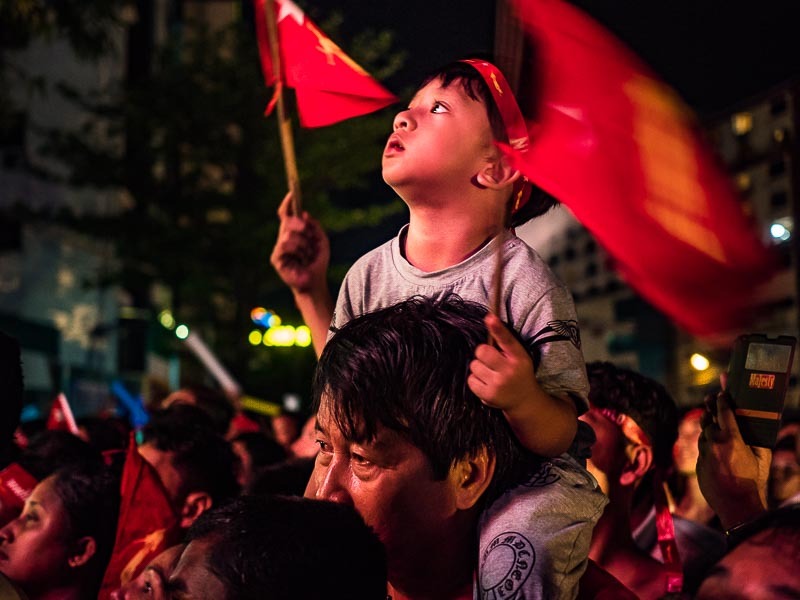 People with a NLD flag during the celebration. Now the real work begins. Aung San Suu Kyi and the NLD have to put together a government and negotiate a transition with the incumbent USDP and military. And even though the NLD won a smashing landslide, they still face a huge challenge in the parliament because under the current Myanmar constitution, 25% of the seats in both chambers of the parliament are reserved for the military. Also, ASSK is constitutionally prohibited from being President because her sons have UK passports. Unless and until the constitution is amended, she will have to govern in some unofficial way. She has said repeatedly that as the leader of winning party she will be making the decisions and the President will answer to her. Finally, under the constitution, the military retains control of the most important government ministries (defense, interior etc). Myanmar will not have a fully formed democratically elected government but rather a unique civilian / military hybrid. People watch election results come in at NLD headquarters. There are more photos of the NLD victory celebration in my archive or available from ZUMA Press. 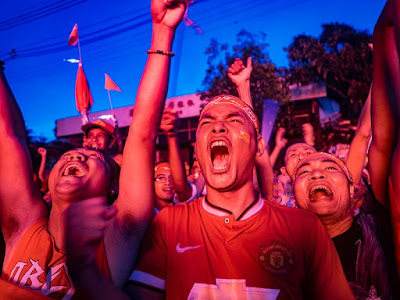 This post was written from Bangkok and is my last post on the Myanmar election. More regular postings, including catching up on non political posts from Myanmar resume tomorrow.